An Airplanes and Rockets visitor asked me to make good on my offer to scan articles of interest to visitors - in this case one from the 1973 edition of American Aircraft Modeler. Titled, "Uncle Sam's Plastic Air Force," it details the ambitious project the military undertook to provide visual aids to servicemen to help them identify enemy aircraft and, equally as important, to identify friendly aircraft. 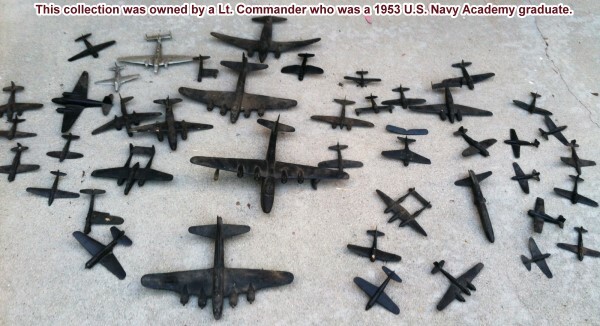 This private collection of World War II plastic identification airplane models is, as of this posting, available for purchase. It is owned by the estate of a former Lt. Commander in the U.S. Navy who was a Class of 1953 U.S. Naval Academy graduate. Please send me an e-mail if you are interested and I will pass it along to the owner. Plastic" was not a household word in 1942. In fact, it was so new that de­scriptive words like "hard-rubber," "wood compress," "very hard plaster of Paris" were more accepted terms to describe the material used to produce thousands of solid plastic model planes when they first appeared during WW II. A few plastic models preceded the war, but for the most part, the black recognition models of the war period appear to have been the start of the most popular form of model planes today." Top: This was the typical method of displaying models for identification purposes during the war. Navy officers study ship recognition models, too. Above: When a large number of models or very big planes were to be modeled, a scale one-sixth of the standard size (1 :72) was created. The smaller scare model is 1 :432, some of which could be carried in one's pocket for instant reference. The "Black 10 Models," as they were generally called, were such com­mon items at military bases all over the world that many servicemen returned home with a few models of their favor­ite planes tucked into their duffel bags. Today, despite the large quantity pro­duced during the war, they are nearly extinct except for a dozen or more ac­tive collections. An unknown number tucked away by individuals have all but been forgotten. The models were mainly used for aircraft recognition. Most of them were ex­tremely accurate in terms of dimensions, shapes and in placement of detail. Placed against a cloud background and photographed, the models could scarcely be distinguished from the full-size planes they represented. In fact, they were often used for just such photographic purposes in the absence of the real enemy planes. The models were also used for range estimation and combining plane recognition with gunnery. Gunners had to know not only the appearance of friendly and enemy planes, but also the size of each so they could tell by the amount of plane seen in the ring gun sight whether it was within range, how much to lead it, and when to fire. Since the models were of a common scale of 1: 72 (1 in. equals 6 ft.), their comparative size could easily be made. A model at 35 ft., for instance, would be identical to the real airplane seen at just under half a mile - and would look quite realistic through a gun sight. 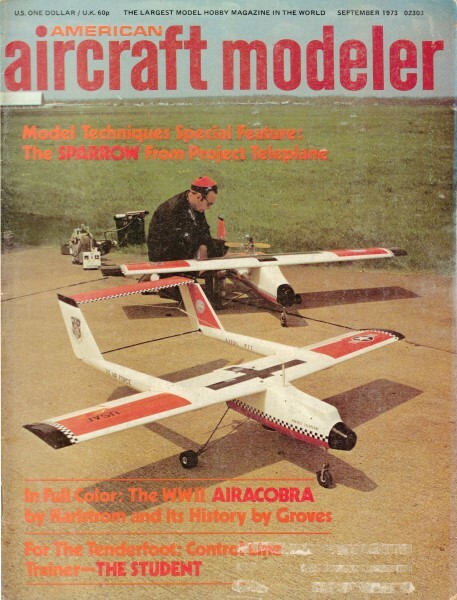 Model planes had another supreme advantage over silhouettes in teaching aircraft recognition. The students could handle them, and therefore were able to study the plane details more easily. For all practical purposes. they were not handling models, "but were actually visualizing the real planes . craft of all the major fighting powers were produced for the government in model form for this purpose. Over 220 types had been issued by the time the war ended - a sizeable fleet in variety by any standard. Models ranged in size from about six-in. wingspan for average fighters, to 24 in. for the B-29. They were typically displayed by suspending them from ceilings for easy viewing in a flying attitude. The program of model planes for the Armed Forces started the day after Pearl Harbor. Navy Commander (later Admiral) Louis DeFlorez had just returned from England where he had seen the British recognition program. This included the use of black model planes in the 1: 72 scale. When students of aircraft recognition handled the models, they could visualize the real aircraft at every possible engagement angle; since the models were all black, features - not colors - were emphasized for identifying friend and foe. DeFlorez. who had been placed in charge of the Navy Bureau of Aeronautics, Special Devices Division, brought a few of the models back from England as samples. Two men were prominent in helping instigate a program of models for aircraft recognition purposes - Lieutenants Donald L. Hibbard and Paul A. Garber. Lieut. Hibbard, later to become Navy Captain, was DeFlorez's Executive Officer and handled all the administrative matters and procurement details for the model program. Lieut. Garber came to the Navy at the outbreak of the war from the Smithsonian Institution where he was the Assistant Curator for Aeronautics. He headed the technical aspect of this unusual program. Garber, later a Navy Commander, was well-suited for this post, for he was a well-known educator in aviation, an historian, and model craftsman. Vast numbers of models were needed quickly. The hand carving of wooden models would be too time-consuming, although many Ground Training Units put technicians to work doing just that. Each hand-built model reflected the personality of its builders, however, and standardization was nearly impossible. A more productive method had to be devised. Commander DeFlorez asked that manufacturing representatives make bids on Navy contracts to produce these precise models. Some of the initially interested bidders were: Design Center of New York, V. Roxor Short of Clinton, Connecticut, The L.A. Darling Co. of Coldwater, Michigan, and a firm of display arrangers or makers organized by George Benckenstein of Cincinnati, Ohio. All four received contracts because production methods and materials to be used had not yet been explored and perfected. The story of each recounts many problems ranging from labor shortages and unfulfilled Navy contracts to legal actions. The manufacture of molded model planes was a new and very difficult field of endeavor. Finding a suitable material with which to mold the models and then gearing production methods to it were the greatest problems. First they tried reinforced plaster compound, using the technique for forming mannequins. This did not make a perfectly clean job for mass production - the appearance of the finished plane was apt to be lumpy, and plaster models shattered when dropped. Since the models were to be sent overseas and had to stand rough handling in transit (to say nothing of the handling they would get in actual use). plaster models proved unsatisfactory. A substance resembling hard rubber followed, but this also proved unsatis­factory since the wings of the larger models tended to droop. Cast iron as well as Wood's metal were tried and produced accurate models when the dies were properly cut to allow for uneven shrinkage. The weight and scarcity of the material were the deterring factors. Above: Aircraft with larger than 99 ft. wingspans were modeled in the special 1 :144 scale. Note even "modern" jets are produced-the B-47 and B·52. Left; Here the author holds a Bv 222, the largest of all WWII issued ID models, with a span of 25 inches. Experiments were made with paper mache, but this substance also failed to have the desired detail necessary for good models. Some of all types pro­duced, however, were distributed into the training aid system. process of injection molding of cellulose acetate plastic was newly developed and had been pioneered by the Cruver Company of Chicago, (a division of Werner Manufacturing Co.) makers of many automobile plastic accessories. Model plane war production became top priority for the company, for their manufacturing method, speed, and plastic material was very satisfactory. Being a fraction of the weight of die cast metal models, and able to take hard usage, they could easily be shipped without the danger of breakage. Yet, there was another important advantage - they could be manufactured rapidly. This was especially important in the days when the armed forces were anxious to have model planes by the hundreds of thousands. A single mold could produce from 35 to 60 model planes an hour compared to a much smaller production rate for plaster of Paris models. Finer detail could also be achieved with this plastic. The acetate plastic they used is about the same by today's standards, but the molding and processing methods have changed considerably. Among those that have survived over the past 30 years, few show deterioration; only extensive heat or the sun's ultraviolet rays have any real effect on them. Before production, an original master model had to be made for each type of plane. The Comet Engraving Co. and the H&H Specialty Co., both of Chicago, made most of these masters. The Army now had joined the program with the Navy, and collectively furnished silhouettes, photographs, dimensions, and occasionally additional sketches of the original plane. Skilled model makers, accustomed to working with no more than the clues offered by the photographs and drawings, began to carve the master models by hand from wood. The completed master models were then sent to specialists in the Army and Navy for approval. Once accepted, the masters went to Cruver where dies were made and the planes were ready for production. The granular plastic was placed in a molding machine and heated, upon which it assumed a fairly viscous state comparable to the consistency of molasses. The material was then forced into the die at a pressure of about 30 tons per sq. in. - enough to force the slow­flowing material into every crevice and groove of the die. The die was then cooled in water. The time of cooling varied with the temperature, humidity, and the size of the model plane. (A fighter-size model took about 45 sec.) Although the models could be made in automatic machines, they usually were taken from the die by hand and immersed in water to cool and harden further. The rough models were then cleaned. The gate through which the plastic entered was cut off, the parting lines cleaned and sanded. The model was complete, except for painting. Large quantities of carbon black were molded in with most of the plastic used; this caused the cast plastic to be shiny, and details to be lost in the highlights. The planes were therefore given a coat of matte flat lacquer. Finally, they were packed individually in boxes designed for each size model. The more complicated models were fastened to the carton so they would be less likely to shift and be damaged in transit. Because of size or design complications, several types of models had to be assembled. Large planes, such as bombers and transports, were made hollow which required them to be manufactured in more than one piece. Other planes, such as the Martin Mariner, had several struts, floats and twin tails which all had to be hand assembled. All biplanes, especially those with floats to be added, presented major assembly problems as opposed to the single one-piece fighter types. Just as in the actual aircraft indus­try, where a type manufacturer had to farm out subassemblies to other com­panies in order to meet production sche­dules, Cruver also resorted to this solu­tion. For the construction of the Consolidated Coronado four-engine flying boat, for example, the wing was cast by one company, the twin-tail by another, and the model then assembled by Cruver with the parts that they pro­duced. As the war progressed, several companies, such as Design Center and Leominster, became involved in the ID model production. Above: This is part of the Smithsonian Institution's collection in Washington, D.C. How many can you identify? Embossed on the bottom of each model from the mold was the name or type of aircraft, the nationality which it served, and the issue date. If a modification was made to the mold, the date would be changed. In the case of the postwar models, when a new production run was made, the current date was generally added. A trademark identifying the manufacturer was also included. ecretary of the Navy Frank Knox re­quested that high school students join in the construction of "recognition models" to be carved out of wood. It was hoped that these wooden models could be delivered to the armed forces quickly while the plastic model program was getting off to a shaky start. The youngsters of America, the actual producers of the wooden models, needed little prompting to get started on this important project. It gave them the feeling of contribution to the war effort. DeFlorez, by now the Commander of the Training Division of the Navy, was the originator of the idea of school­built models. The Navy agreed to sponsor the program and defray the cost, and to be responsible for the selection of types and the accuracy of drawings supplied. The Office of Education distributed the plans and instructions through State Representatives. The construction of models and the inspection took place at the local schools, generally within the Industrial Arts program; the Navy provided collection centers and distributed the models. This was a nationwide program and thousands of youngsters participated. Heaviest concentration for organized production was in the metropolitan areas, where actual production lines were sometimes established. By the end of the school year 1942, hundreds of thousands of models had been delivered. Many students continued to work through vacation, attending classes at summer school or making the models in their home shops or community workrooms. A well-planned model construction method was developed to suit this program. For each aircraft type selected, a complete set of full-size templates was produced. Each plan was illustrated in a pictorial view giving a description of the plane, name of the parts, and a small three-view drawing. Most of these were drawn by Sob Reeder of the Comet Model Airplane and Supply Co., later to join the Monogram Model Co. Comet produced wooden kits for these ID models ranging in price from 15 to 35 cents. Other companies followed with improved kits, and the 1: 72 scale be­came a standard size for the model building profession. Today the packets of templates and instructions for making the models are collector's items. Packet "A" and "B" series each consisted of 20 mixed nationality aircraft types, and "C" series had only ten. Because of the enthusias­tic support within the schools, 300,000 more models were requested for the fol­lowing school year. Template packet "D," "E" and "F" of ten types each produced 30 new wooden models to be handcrafted. The program terminated on a nationwide basis in the spring of 1943 and the "G" series, though printed, was not distributed. "Plastic" was not a household word during WWII. It was something novel. Here an early modeling machine produces the Savoia Marchetti SM 84. Method is crude by today's standards. The form of recognition models went beyond the 1:72 scale plastic and wooden types, however. Since these were space consuming and sometimes awkward to handle, a series of models one-sixth this size, or 1:432 in scale, were manufactured. Though diminutive in size and detail. the three-dimensional effect was retained. These were cast in both metal and injection-molded plastic by several companies. The more popular metal issues by Comet Metal Products Co., Inc. were painted in more appropri­ate colors instead of the flat black of the larger models. Shortly after the war Kix Cereal offered various sets of four plastic types for a box top and a given amount in coin. Today, one manufacturer is reis­suing a number of types in the 1 :432 scale series from the wartime molds. As WW II came to a close, so did the need for the identification models within the military services. The program was all but abandoned until the military buildup during the Korean War. Once again the U.S. Government ordered molded models of planes used in this conflict. But being a confined war and not worldwide as before, production quantities were kept relatively low. Changes in general appearance of 10 models in production took place around this time. The typical black models were replaced by planes with a light gray finish; in addition, canopies on models were cast in clear material which greatly added to their realism. Some models were cast in a blue plastic, typical of Naval aircraft color at that time. The quality of plastic used had improved over the years, cellulose acetate butyrate being a later type. Postwar aircraft progressively increased in size, and so did the models. The 8·36, for example, was a gigantic, heavy model built to the 1: 72 scale with a wingspan of 38 in. Consequently. a newer scale of 1: 144, one half that of the others, was adopted for aircraft hav­ing wingspan in excess of 99 ft. This proved a more practical size for handling, but did have drawbacks in comparing sizes between the two scales. Continued cutbacks in military spending finally brought an end to production of the plastic 10 models by 1961. An estimated 425 types or variations of models of the larger sizes had been manufactured during those 20 years. The total quantity of models actually cast reached a phenomenal number and can only be approximated at over one million. Stockpiles of the current types of planes then in use were retained, but almost unnoticed. The Air Force was the first to go out of the "model airplane business." Without the newer types of planes, the remaining models were of little training value. Due to the cost of storage, and relatively low value of individual models, the warehouses were ordered to eliminate their stocks. In conjunction with Armed Forces Day in the early 1960s. every child that entered a base (Hill AFB in Utah, primarily) where these training devices were on hand, was given a model airplane. That ended the program for the Air Force. Just recently the dwindling stock retained by the Navy, the founder of the program, was transferred to its auxiliaries for their use. Models in collections today have come from a variety of sources. A few actually came from military salvage after they had served their purpose. As the military requirements diminished, backlogs by the manufacturers were released to the open market and were purchased by the general public, from hobby shops. The largest distributor was Distinctive Miniatures, of Newark. New Jersey; Polk's of New York was the largest dealer. For commercial use. 10 models were called Aristo-Craft. but the term didn't stick. Their prices ranged from $1.50 to $8, depending on the size and complexity of the model. It is the postwar "grays" that are the least common in collections. This is due to the fewer number produced. Today some builders of plastic models paint and use the ID model as a filler in collections when a shell kit is not available. Often these are the rare types, but they often flood the collectors' circle when a shell kit is introduced. Despite the large quantities of ID models issued. and the efforts by collectors to obtain various types, several models produced by the hundreds cannot be found. In many cases only one or two of a kind have been located. Although these are naturally valued very highly, the sincere collectors prefer model exchanges among themselves, rather than selling for money. The search will go on for the missing or rare types. Perhaps the boy of long ago that was given one of these tokens of the war, or the crew member that kept one as a souvenir, unknowingly has one of these rare models. All are of interest to the ID model collector. What do you have tucked away in your attic?